Small, delicate, graceful, the Least Tern embodies all we love about birds and then some. Have you seen their chicks? Adorable. 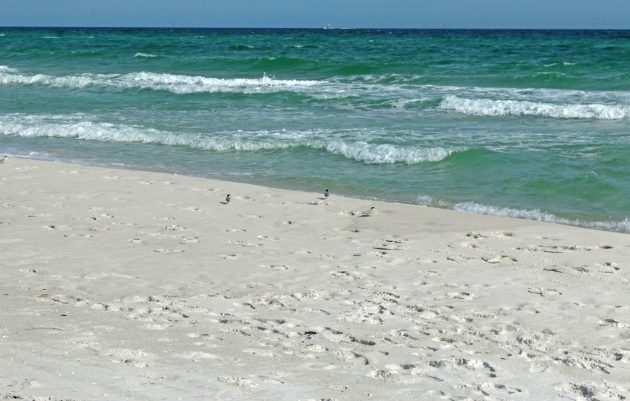 Every spring, we birders along the Emerald Coast wait for their arrival with bated breath, grinning from ear to ear when they patrol the beach once more, diving for food in the shallow waves. For me, that moment came last week. Taking my usual route along Okaloosa Island’s Beasley Park, I noted Laughing Gulls, Brown Pelicans, a Snowy Plover or two, and the usual packs of Sanderlings. 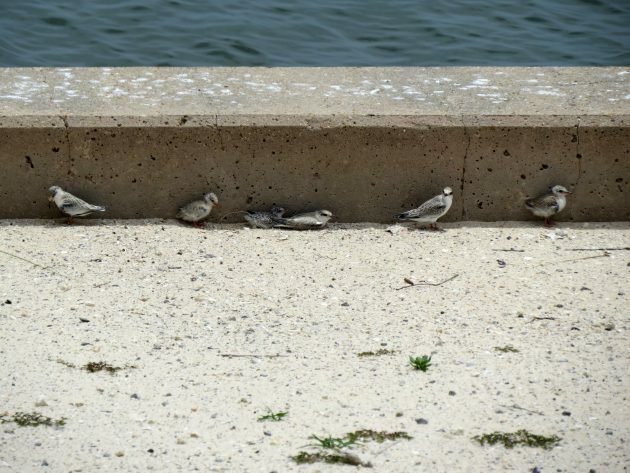 Deep in a walking reverie, I was startled out of my daydream by a group of tiny terns perched at the edge of a sand embankment, looking over at me as I looked at them. There is no mistaking a Least Tern: they were back! Though they weight less than two ounces, Least Terns migrate from South America to the West, East, and Gulf Coast to breed on dunes or flat gravel roofs (there are also populations in the middle of the United States). Unfortunately, their preferred habitat is also preferred by their human counterparts, lost to development or full of sunbathers and swimmers. Populations have dipped by over 85% since 1966, and today their global populations range from 60,000-100,000 individual birds. In Florida, the Least Tern is a state-designated threatened species; the interior populations are federally endangered. Young Least Terns enjoying some shade. The terns I watched were clearly resting. Though eyeing me (I kept my distance), they seemed otherwise uninterested. Every so often, one would rise to the air and take off, flapping down the beach in search of a meal. Perhaps the males will grasp fish in their small bills and bring the morsels back to prospective mates. It’s mid-April, and soon they will begin laying eggs. Three weeks later and chicks will hatch, running around barely three days later. Keep your dog on a leash – I love dogs, but sometimes their enthusiasm gets the better of them. If they are on a leash our pets are less likely to damage a nest or chicks. Avoid walking near dunes – Nests are expertly camouflaged, and even the best intentioned of us can trod over them accidentally. Staying near the surf line reduces risk of stepping across a nest or chick. Support beach and dune preservation – By protecting the dune ecosystems, we will protect critical nesting habitats for nesting terns. The Mexican Government has also fenced off a 3 acre area on the very popular beach as San Jose Del Cabo. They even went so far as to build a raised observation platform to view from. The tourists are very respectful, and enjoy the viewing, but I wish the locals would buy in a bit more. Still too many wandering dogs, that find a way iunside th fence!